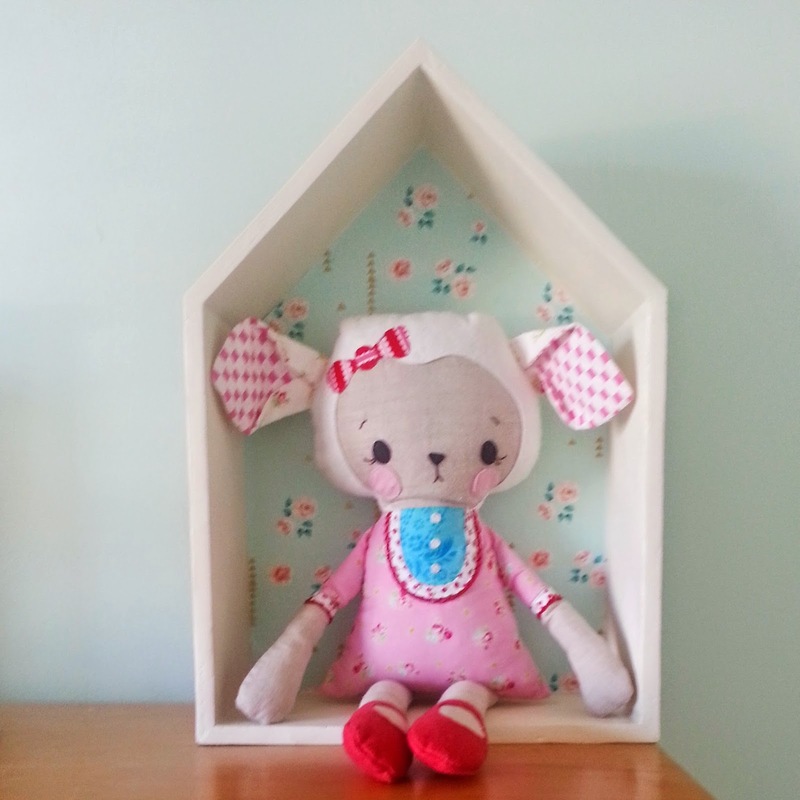 After walls were painted, I started painting items for her room, and sewing bedding. 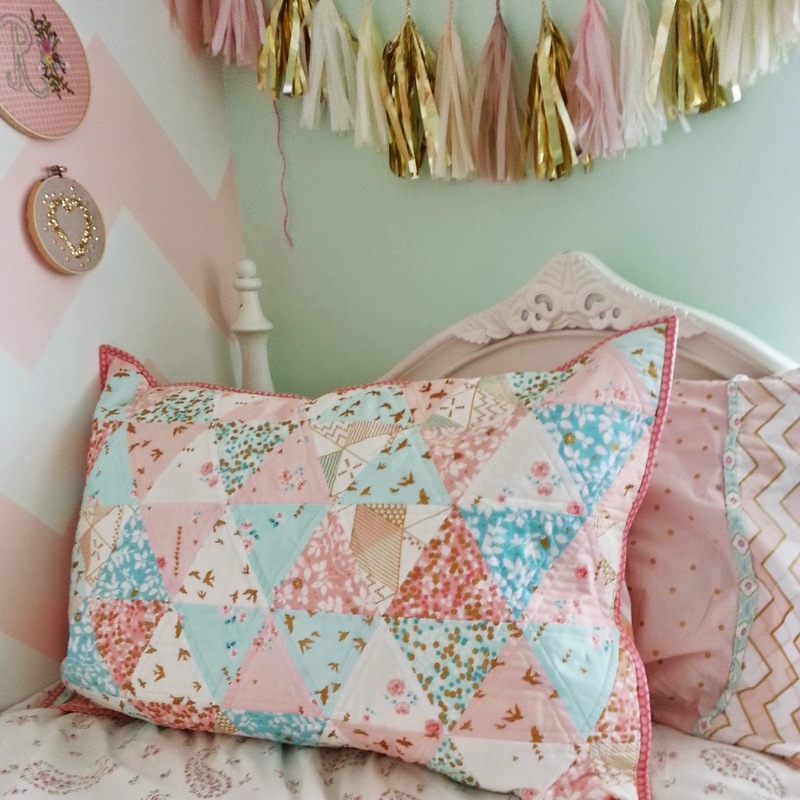 First is this triangle quilt pillow. I used this tutorial I found on Pinterest. Pretty easy, the triangles were easier than I anticipated. I quilted the sham with just a quarter inch around each seam. Simple and nice. Here is the first pillow on her bed. Love. What makes me happiest about this room is how much me and my daughter created for it. 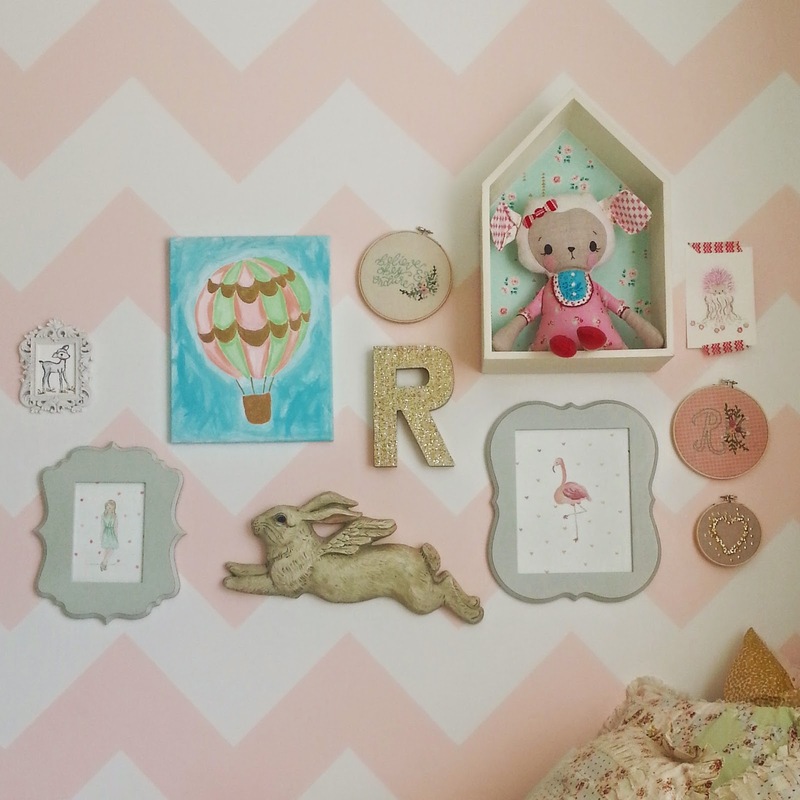 We painted the walls together, and everything on this wall is made by us except the flying bunny. (and frames) I painted all the art, and me and my daughter did the embroidery projects. We still have a few more plans, but I am really happy with everything so far! Such a beautiful room!! I really love the soft tones, I would have loved this room myself some years ago :)Plus it's so great to work together with your daughter, I have lots of memories doing the same with my mom and this is what really matters! so lovely! 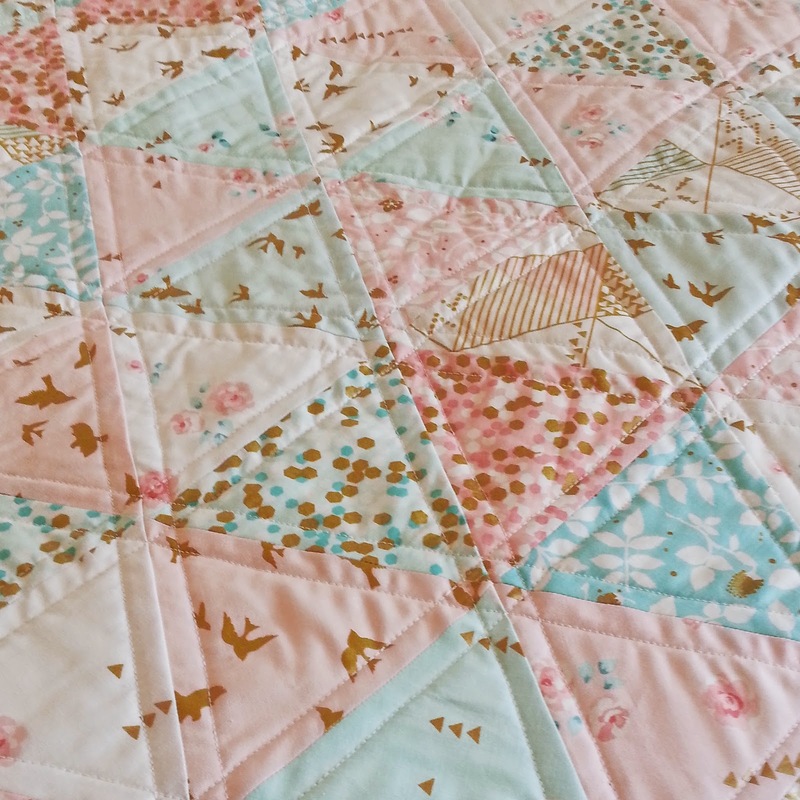 Great quilting, great soft colors. Love it all! 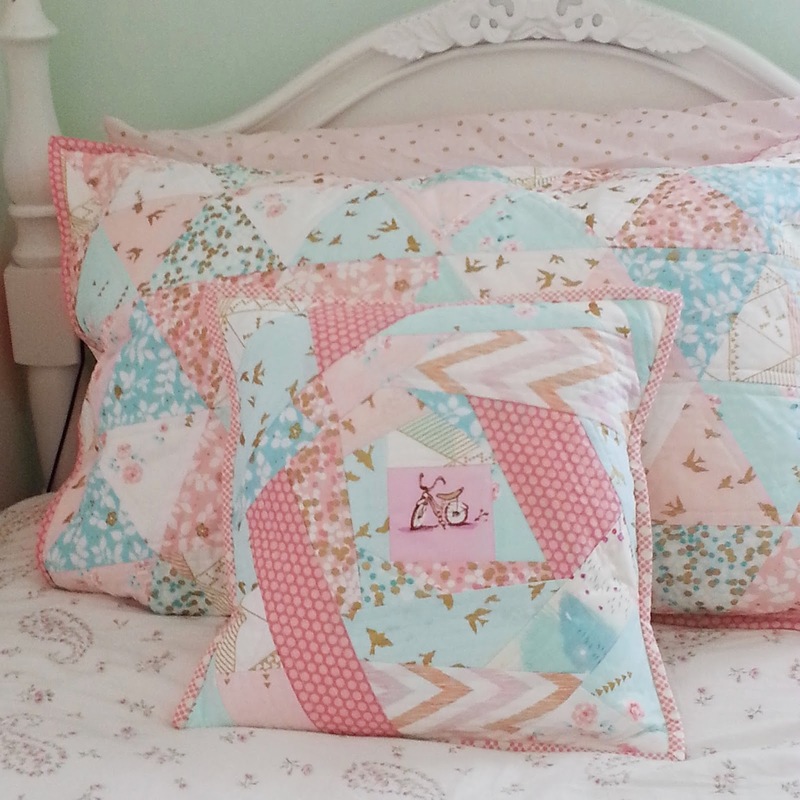 How smart to make the quilted sham and accent pillow to go with the bedding you had found (and not have to make a whole big quilt!!). Everything is darling!! It all looks lovely and how wonderful you did it all together. Heather, you haven't just made an incredibly sweet and charming room, but you have also made precious memories with your daughter! Everything is so soft and magical!!! Y'all have done a beautiful job! I am so in love with the brambelberry line. And that MM Glitz! It's stunning! Really lovely! 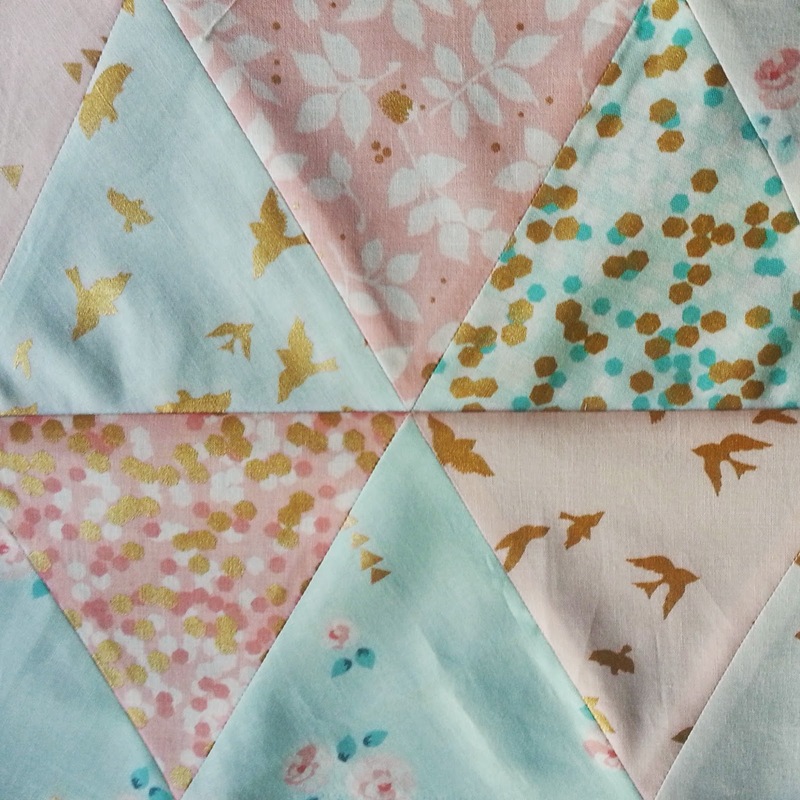 It didn't occur to me to make a pillow from smaller triangles. Love the effect! Everything about that room is super cute Heather! I have loved seeing it evolve on IG. How special and beautiful! love the pink/green combo. *sigh* glorious. The colours just make me feel so happy! Beautiful! What a fun project to do together! Your pillows are gorgeous! Did you paint the chevron on the wall? Vey cute! Darling! 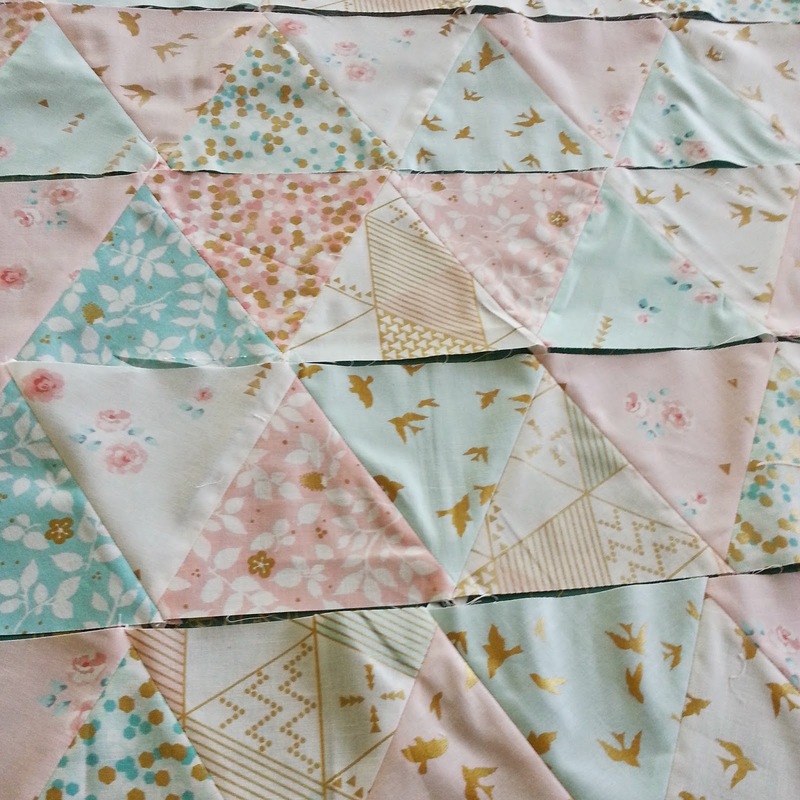 I admit to being a little gun shy of equilateral triangle piecing. Ohhhh, your pics are tempting. I love this room so much! I love how you and your daughter have handmade so much of it together. So sweet! 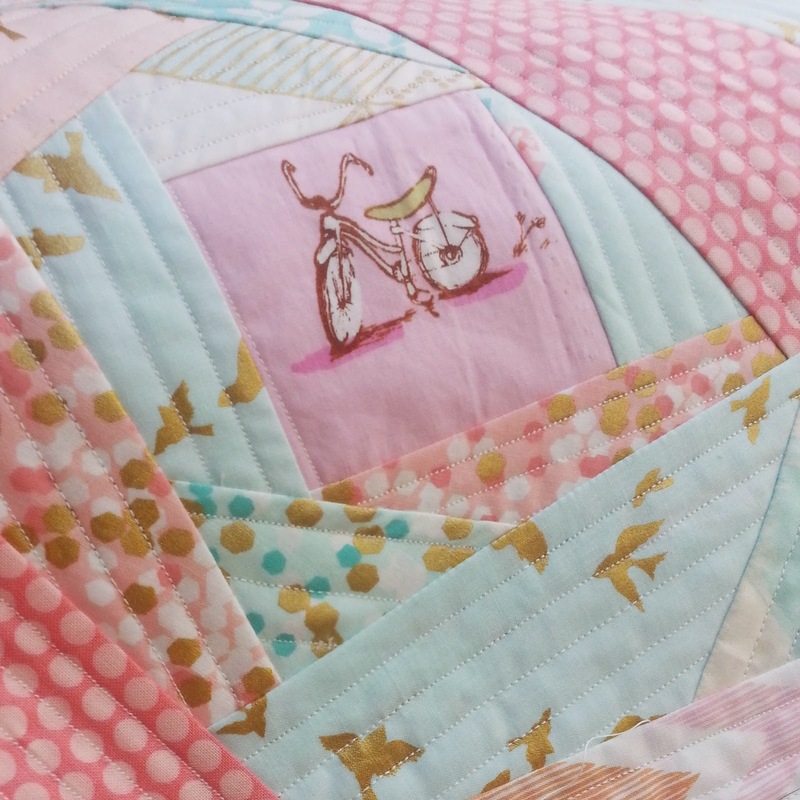 And darn it all if I don't love that wonky log cabin pillow with that sweet HR trike at the center. Beautiful! Wow! Amazing job. It looks like you pulled these pictures straight out of a magazine! Beautiful!!!! 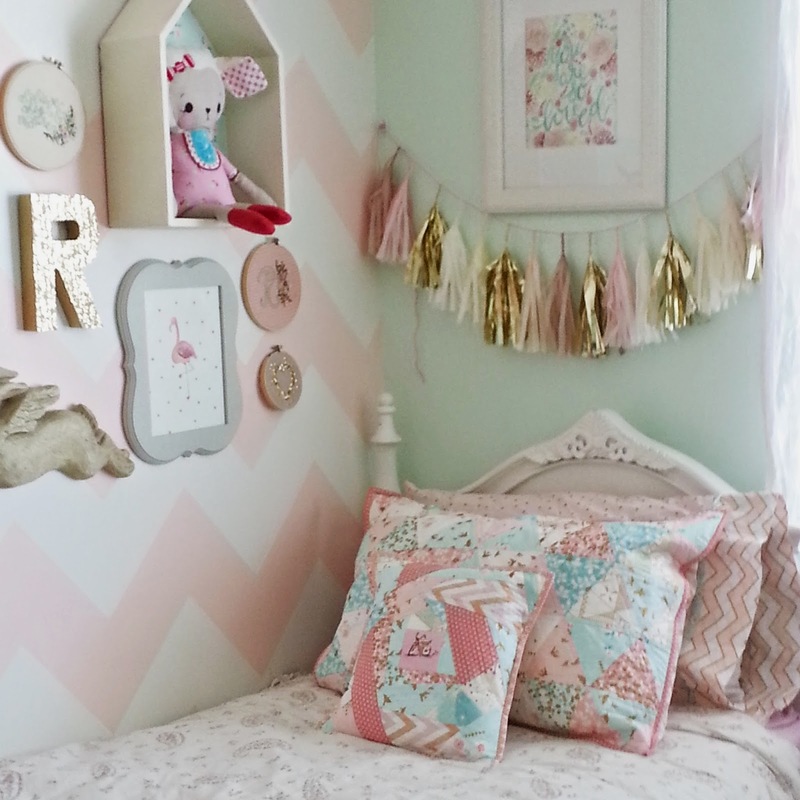 What an amazing bedroom for your daughter! I am hoping to do something with my daughter for her room. If they help does it make them want to keep it clean? Those are the colors I wanted as a tween. Any girl would be thrilled with it. OH MY GOODNESS!!!! I want this room for myself, and I'm in my early 30s!! The color palette is truly spectacular; I've seen those colors used heavily in PBTeen rooms, and just ADORE them!! One negative, and I know I come across as a grammar Nazi to almost everyone I know, but you keep using the verbiage "me and my daughter." Why?! Oh, why!? It's either my daughter and I, or my daughter and me, depending on its use. I hate that this bothers me. :( I'm sorry. 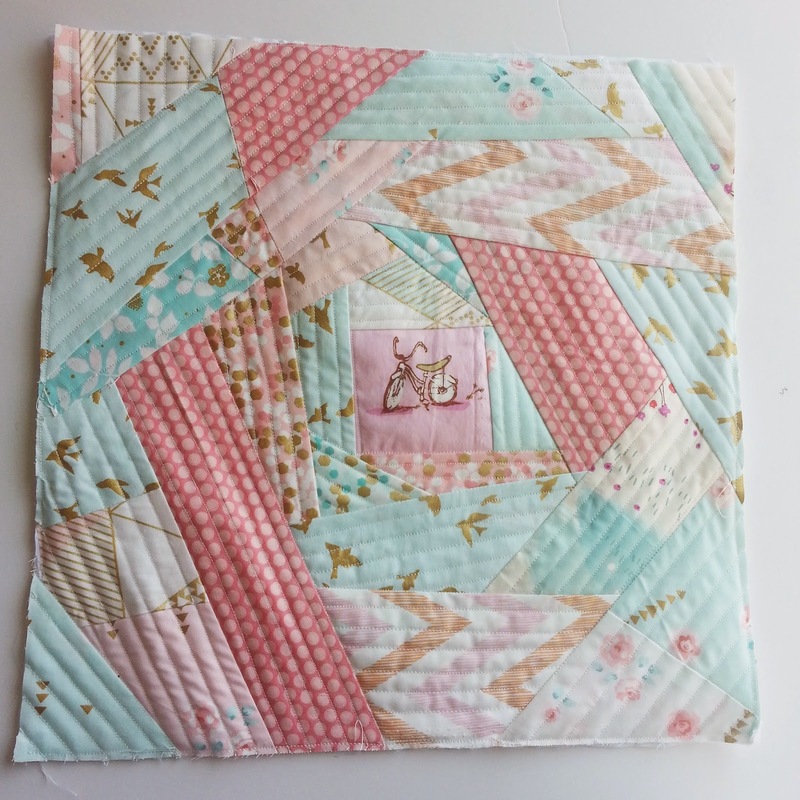 You're definitely FAR BETTER than I at all things quilty, though, so I'm totally sure you could school me far more than I could ever school you. This is very nice home remodeling and decoration ideas.